UK's best range of CD jukeboxes for sale, for home and commercial use. All with free delivery and installation for your comfort. Visit our showroom to see and hear them for yourself. Our range of CD jukeboxes brings the classic design up to date, giving you the best modern technology with classic style. Jukeboxes popularised recorded music in the 1940s and 50s, when social hot spots were packed with young people ready to dance the night away to the new Rock and Roll music of the era. Jukeboxes fell out of fashion in the 60s, but are now enjoying a new lease of life. With the rise of interest in vintage products, these beautiful machines are making a comeback, with more and more people enjoying these fun and nostalgic machines at home and commercially. Our brand new CD jukeboxes are a popular alternative to vintage and vinyl jukeboxes. They are based on the stunning original models of the 1940s and 50s that are still well recognised and loved designs now. We offer a wide range of exciting CD jukeboxes for home and commercial use from such reputable brands as Wurlitzer and Sound Leisure. These impressive machines are replicated from the most popular models of the silver age and are a stunning addition to any room. They have been engineered to produce the same rich tone as the original jukeboxes by using commercial grade CD players, which are designed to withstand heavy use at home use or commercially. The amplifiers produce an output of 300 watts, with a deep bass and crystal clear treble. Our CD jukeboxes are reliable and easy to use manually or via remote control and can be made to be used with a coin mechanism for a commercial environment, or set to freeplay for unlimited fun. 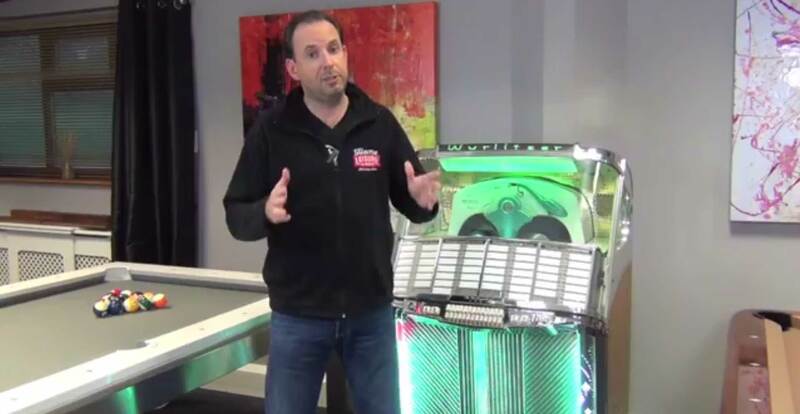 Along with a wide variety of styles and colour, these jukeboxes have various customisable options for lighting, finishing, graphics, glass and connectivity. Some can be specified to incorporate an iPod dock, which will enable you to use either an iPod or iPhone. This is great if you want to be able to enjoy your complete music collection, or to listen to friends and family’s music, without you needing to remove your precious CDs from their new home. A selection of these impressive machines is on display in our Bristol showrooms. Our specialist staff are here to advise you on the make and model perfect for you.